To understand the history of this temple, one must distinguish between the story of the statue, so famous, and that of his temple. Because the temple is only a case for this little jewel of the Asian statuary so particular. It was not the only one in history, and the latter may prove to us one day that he will not be the last. Still, the statue has its origin in the fifteenth century, while the temple, he dates from the eighteenth. The story of the Emerald Buddha is explained in the part dealing with this statue, with its description. Read the history of emerald Buddha. Where did I go back to the tradition of building a Buddhist temple in the enclosures of the royal palace at the Sukhothai temple, I walked in between, nearby, 1240 and 1438. From then on, this era was a capital city, at the bottom of the palace, a temple . Lorsque Râma 1er (1782-1809) choisit Bangkok comme capitale, du début de son réegnne, il ne fit pas exception. Whenever I went to the East of my palace, I gave him Bouddha d'Emeraude that he had recovered from Ventiane, to Laos. The construction du temple prit deux ans, from 1782 to 1784. It commences for the construction of the parties Sud et Ouest, then, in a twelfth time, where it will build other buildings in the North and the East. The ensemble will quickly grow into a magnificent gallery length. The premiere buildings furiously resemble the ubosoth, who was destined to receive the Bouddha d'émeraude, because the library arrives. Il fait aussi will build the 12 small buildings that will burst in on us, the ubosoth, the 8 prangs of the East (tours de style khmères) and the gallery. Well, the terrace was built, with no stupas in the East. The building named Ho Phra Nak comes quickly afterwards, at the north-west angle. The fire burned quickly more tout of the suite reconstructed by the brother of Râma Ier. Under Rama III, in the middle of the 19th century, the temple underwent great restorations. He began with the library and all the little pavilions surrounding the ubosoth. He then restores two stupas in gold and the eight prangs of the East. He also had a series of small works whose purpose was to embellish the area, from a general point of view. But it was under Rama IV (1851-1868) that the first important works were carried out. He enlarged the terrace on which the library is, and equipped it with a double balustrade. He pierced six gates, had six staircases built, and added the gallery to the east and west. Entrances were sumptuously decorated. In 1855 a new stupa was built west of the library. 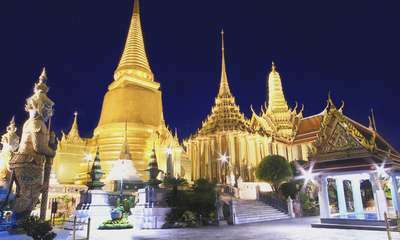 It is called Phra Si Ratana Chedi and we know that it has hosted Buddha's relics. It was Rama V (1868-1910) who made the golden mosaic decorate it. Among the additions, in 1856 Rama IV ordered the construction of the "Royal Pantheon". It is a small prang that was to host the Emerald Buddha, but it was built too small to hold ceremonies and was eventually left unoccupied. The stupas built by King Rama I were replaced by golden stupas which were installed on the terrace in front of the East Wing of the Royal Pantheon. As for the library itself, it was restored at that time. The model of the temple of Angkor Wat that can be seen in the north of the library was begun under Rama IV and inaugurated under his successor. It was intended to remind that Cambodia was under Thailand's rule in the middle of the 19th century. Also under Rama IV, a new building was built, the one designed to protect the bronze Buddha called "Buddha Gandhara". It is a statue carved under Rama I, representing Buddha in traditional Chinese monk dress and calling the rain with his right hand and receiving it with his left hand. Such a statue needed a small protective building. Rama V improved it with the addition of a tiled roof. South of the ubosoth was built a belfry replacing another, older. In the West it is a simple pavilion which was added, pavilion which was framed by two other smaller pavilions. The North is called Rachakaramanusorn while the South is Ho Rachapongsanusorn. The middle pavilion houses 34 small statues of bronze Buddhas in various attitudes. Ubosoth was also impacted by the restoration work of Rama IV. The roof was redone, the interior paints improved. We redid the decorations of the doors which, initially painted, were covered with mother-of-pearl. He also had the tiles around the base of the ubosoth redone. As for the galleries, the paintings were also restored, but this work was so long that it lasted until the reign of Rama V.
In 1882 came the centenary of the city of Bangkok. For the celebrations, the king restored and improved part of the Emerald Buddha Temple. It is this restoration that is considered the second most important in the history of the temple. The Phra Si Ratana Chedi was covered with golden mosaics. He had carved gilded bronze animals that are nowadays on the terrace of the Royal Pantheon. He also wrote poems telling the story of the Rakakian, texts that were placed on the columns of the gallery to explain what is shown in the frescoes, in the same place. These poems were created by the king, princes, officials and monks. He also added two great demons on the model of the 6 that already existed and which dated from the reign of Rama III, then memorials concerning the kings of his dynasty. In the North-West are a building common to Kings Rama I, II and III, to the South-East of Rama IV and to the South-West of the Royal Pantheon his. During the twentieth century some other restorations took place at the Temple of the Emerald Buddha. First a fire occurred in 1903, taking the roof of the royal pantheon. It was caused by the electrical installation that was put there. King Rama V had the work carried out under Rama VI done by those on the roof of the library. In 1918 the Royal Pantheon received its true function, the one we know today. It was in that year that Rama VI had five statues of the previous kings of the Sivalai Pavilion, located in the Grand Palace, installed in this room, which had been vacant until then. Two golden stupas were built on this occasion east of the terrace. The latter was modified by the addition of 4 large stairs, one per side. As for the stairs leading to the ubosoth, they were redone to reduce the height of the steps, too difficult to access. 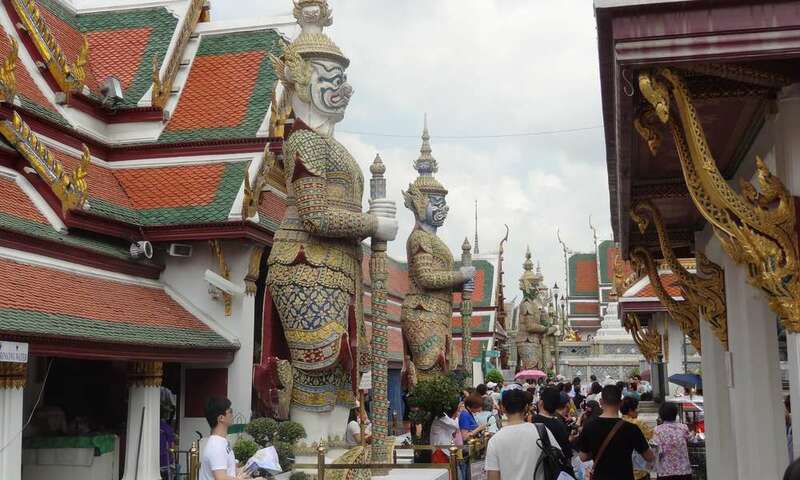 In 1932, then under the reign of Rama VII, took place the 150th anniversary of Bangkok, which was an opportunity to restore again the Wat Phra Kaeo in depth. On this occasion the paintings of Râmakien were completely redone, they had been badly damaged by bad weather. Rama VII also suffered the Thai revolution in 1932. She transformed the absolute monarchy into a constitutional monarchy. On this occasion, symbolically, King Ram Khamhaeng's stone throne, which was brought to the great palace at the beginning of the century and was moved several times, was placed in the Vihan Yod, inside the Buddha Temple. emerald. In 1982 took place the bicentennial of Bangkok, and again the temple received a restoration. The throne of the jade statue was redecorated in gold leaf, the paintings of the Rakakian redone, and the throne of stone was transferred to the museum. The opportunity was taken to build a new building northwest of the Royal Hall of Fame, serving as a commemorative building for Bangkok's bicentennial. It bears the emblems of kings Rama VI, VII, VIII and IX. Today, the temple is both an important religious sanctuary and a major tourist site. Open to the public, and free for Thais, the site allows to meet monks or monks with groups of children in school outings, students and tourists, art lovers and those of the architecture, the curious of local history and those of religion, etc. In short, the site is a web of people with very diverse profiles, just as much from the local population as from other countries.